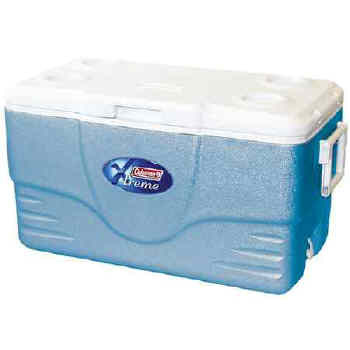 Cooler keeps drinks cold for five days—even in 90°-plus heat—thanks to its Xtreme technology and extra ThermOzone™ insulation. It also holds up to 49 cans and comes with a hinged lid for easy access. There're four cup holders on top, too, and two-way handles for comfortable carry. A rustproof, leak-resistant drain is standard as well, and the lid can accommodate 24" elastic cords for additional dry storage. 26"L x 14 3/4"H x 14"D. Blue.